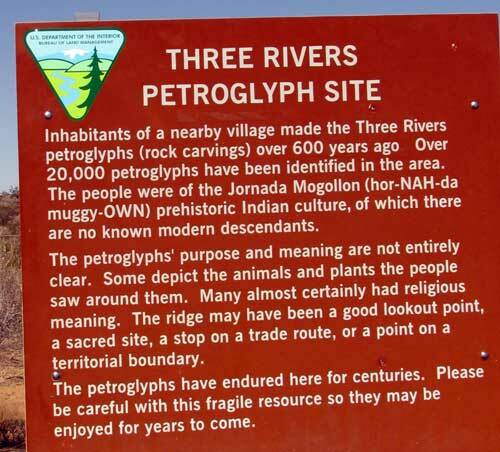 Friday, March 12, 2010: Gwen and I drove to the Three Rivers Petroglyph Site with Ralph and Janet. 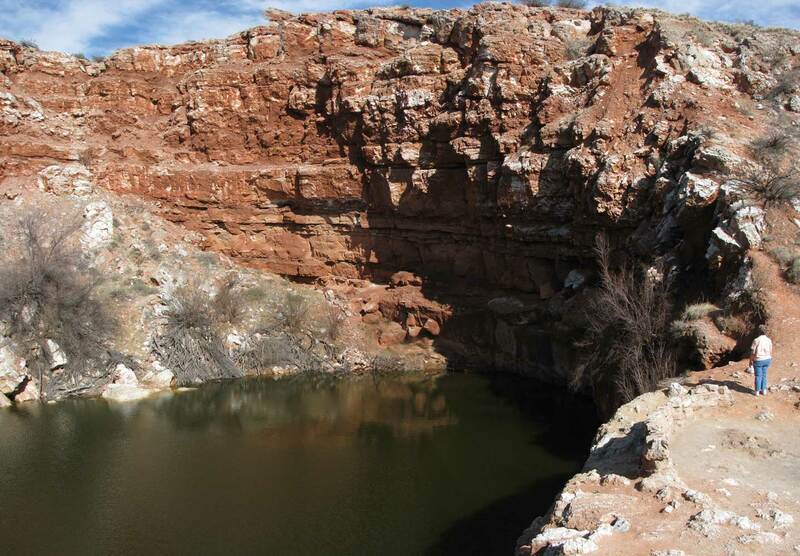 The site is only 5 miles off Route 54 about 15 miles north of our Tularosa Vineyard campsite. 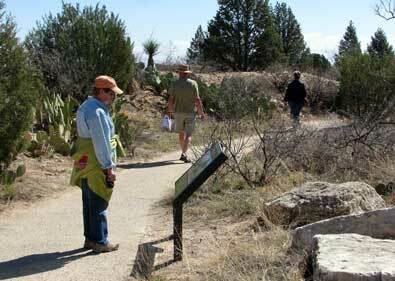 From the visitor's center you see a plain high desert hill with groupings of volcanic rock on the top. The rocks are blackend on the surface from volcanic activity. 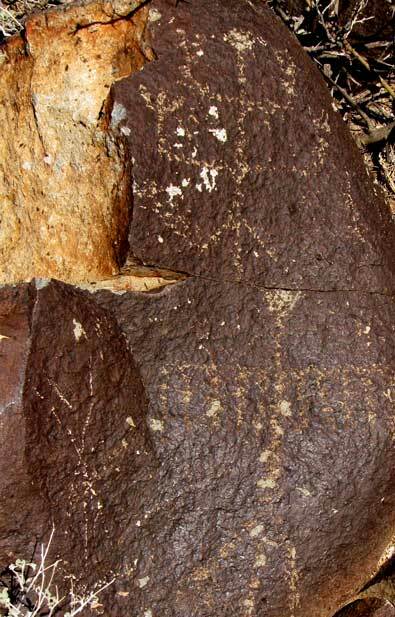 The designs are scratched on this black surface, apparently with another rock. 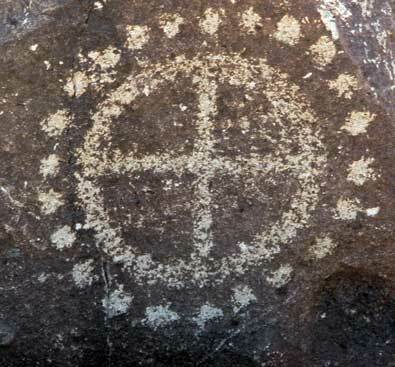 We were amazed that the designs were still intact after 600 years. There is probably very little rain or blowing sand at this location which would wear away the designs. 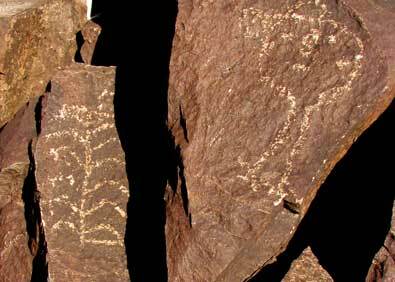 We saw probably a hundred of the 21,000 petroglyphs. They are located only about 1/4 mile from the parking lot so it was easy access. We were also surprised to learn that there is free, developed "dry camping" near the parking lot. 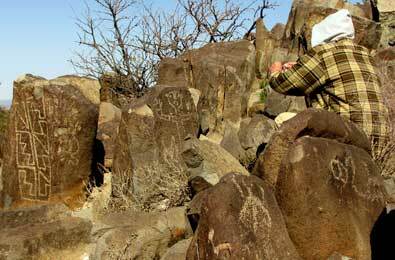 Pass your pointer through the petroglyphs below to see a different view. Saturday, March 13, 2010: The photo above is the western view of the Sierra Blanca (White Mountains). The highest peak is more than 12,000 ft. The Ski Apache ski area is located on the southeastern slope of the mountain (the other side). The base of the ski area is 9,600 ft with the top of the highest lift at 11,500 feet. There is 1,900 vertical feet of skiing. Click any of these photos to get another view. 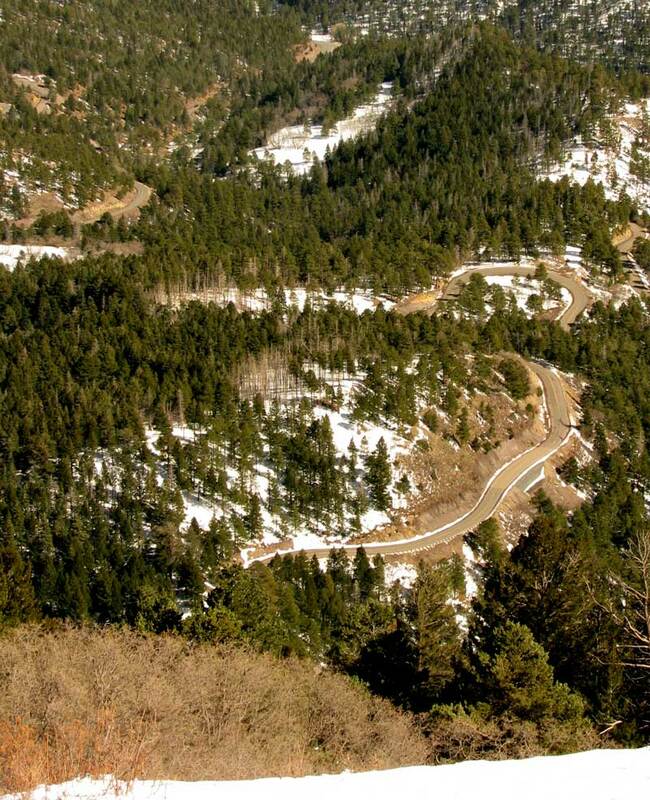 The climb to the ski area from Ruidoso is nearly 3,000 feet of elevation increase along a two lane, narrow, paved mountain road. You can see the road in the photo above showing the view to the east from a roadside pullout to the ski area. You can also see the road by clicking the photo to the left. As we were driving from Leasburg State Park to the Tularosa Vineyards we could see heavy clouds over the mountains. The ski area was getting more fresh powder. It looks like a foot of very nice powder for perfect ski conditions. I'm sure that's rare for this time of year. Ski Apachi averages 15 feet of snow each year. The view below is at the base of the mountain. 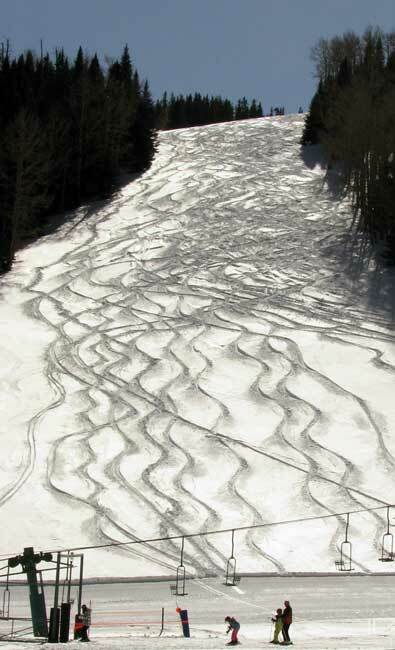 This looks like a great place to ski. In a past life, I did a lot of skiing because I lived on the California side of Lake Tahoe surrounded by Alpine and Nordic ski areas. It's been a lot of years since I've been on any kind of ski but looking at this area makes me want to give it a try. Even without skiing, the view are fabulous. It's so surprising to find this kind of skiing in the middle of a desert. 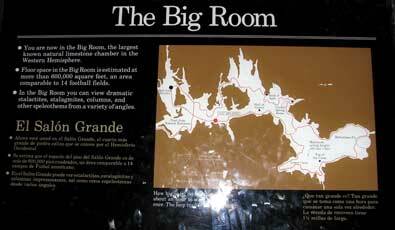 Saturday, March 14, 2010: We are camped at Bottomless Lakes State Park near Roswell, New Mexico. Today we took a hike to one of the lakes. 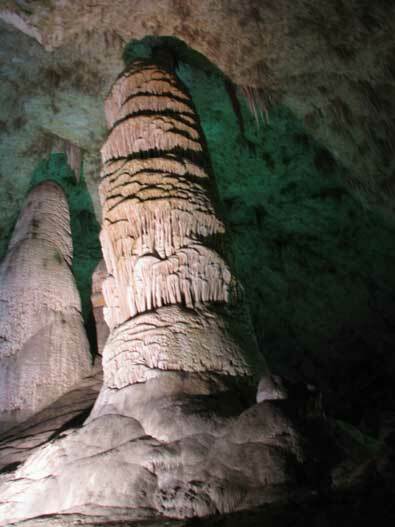 These receive water from underground sources which come to the surface. They are quite deep but NOT bottomless. Lea Lake, where we are camped, is a popular swimming lake during the summer months. Click on the photo below, right to enlarge. Monday, March 15, 2010: Many in the city of Roswell have made the happenings in July, 1947 into a part of the area economy. 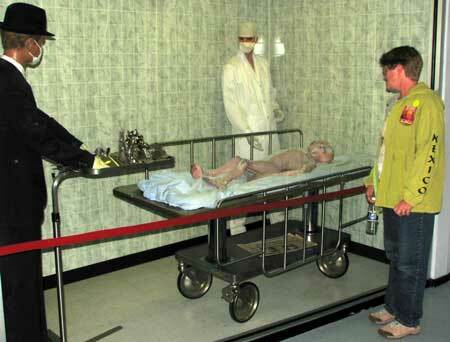 We visited the UFO Museum to learn the secrets those in Roswell are keeping concerning extraterrestrial beings. Essentially, everything in the museum is found in the Wikipedia report. There are a few movie props in the museum which were used in some of the movies made about the incident. The town has many retail shops which use the alien logo to produce store front graphics and collectors items such at T-shirts and hats. Pass your pointer through photos for additional views. Tuesday, March 16, 2010: We left Bottomless Lakes State Park today. As we were leaving we were able to take the photo above which shows an excellent view of the area. The RV park is on the left of the photo while the day use area is on the right. Note the covered and protected picnic area in the beach area. We believe the rock wall protection is needed from the wind. Click the photo to enlarge to see the details. We left the park above for one of the two Escapees parks in New Mexico. "The Ranch" (photo below) was the first park built by the Escapees RV club. We are parked in a full hook-up spot for a week at $72/week. 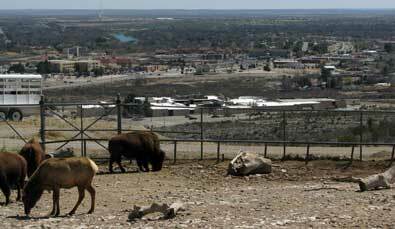 The Ranch is an interesting park, located remotely about 20 miles from any town. They boast to be the most friendly park in the Escapees system and so far, I would have to agree. The leaseholders who I've met seem to be very happy with their residence here. 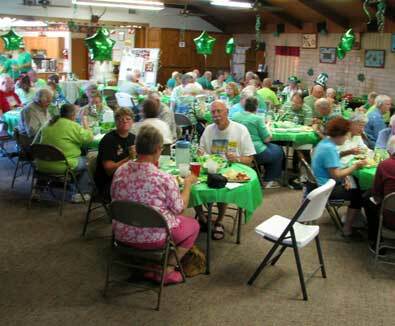 Tomorrow is a Saint Patrick's Day dinner which we will join. Click the photo below to enlarge. Wednesday, March 17, 2010: Today we celebrated our anniversary by going to Artesia, New Mexico for breakfast at the Chaos Cafe (pass your pointer through the photo to see our T-shirts). It wasn't an anniversary dinner for us because "The Ranch" was having a special St. Patrick's Day corned beef and cabbage meal at the club house. Of course we wanted to be part of the party since it happens only once each year. It was a fun time with our friends Ralph and Janet and all the residents at "The Ranch". Oh, they DID sing "Happy Anniversary" to us. Thursday, March 18, 2001: This was a day to clean house plus wash the truck and trailer. While walking around The Ranch with Morgan, I began to notice that most of the lots have storage buildings. 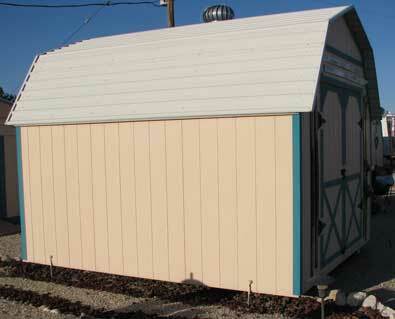 Some have a concrete floor and foundation while many are manufactured storage buildings sitting on blocks. I also noticed that all of these storage buildings are tied down. Apparently the winds can be fierce in Lakewood. Slide your pointer through the photo to see a closer view of the tie-down. 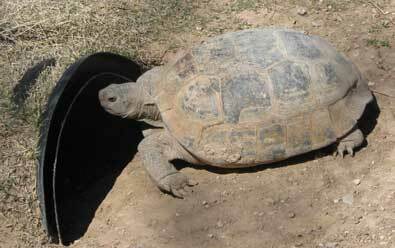 Saturday, March 20, 2010: Yesterday we visited the Living Desert Zoo and Gardens State Park . 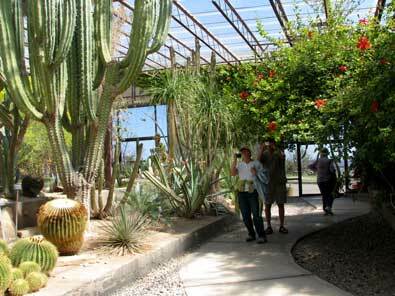 This was an enjoyable desert park on a warm day (unlike today.. very cold). 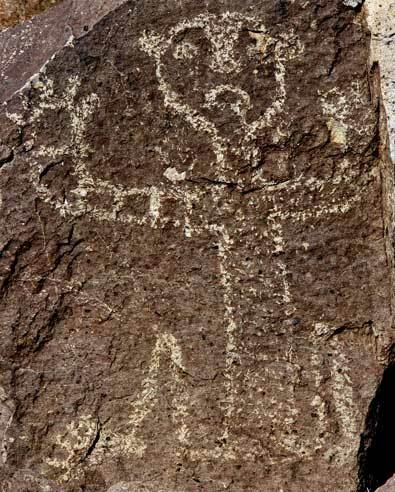 It is located on the top of a hill overlooking Carlsbad, New Mexico. You can click the photo at right to enlarge the view of Carlsbad. Pass your pointing through all the photos below to see another view. 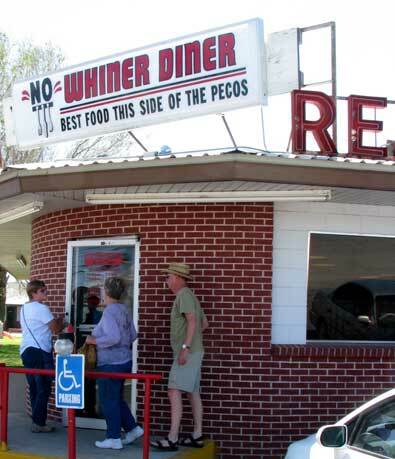 We ended our day at the No Whiner Dinner which was recommended by Martha at the Lakewood Escapees park. 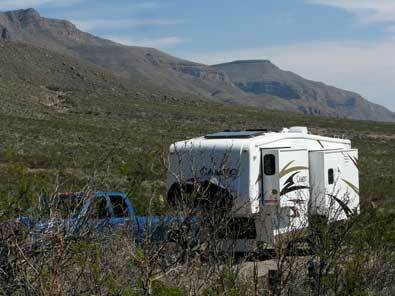 Sunday, March 21, 2010: Today, Gwen, Ralph and I went in search of Sitting Bull Falls which is located in the Guadalupe Mountain range only about 30 miles from our camping site in Lakewood. The fall is fed by a spring and continually drips over the edge of the rock face. 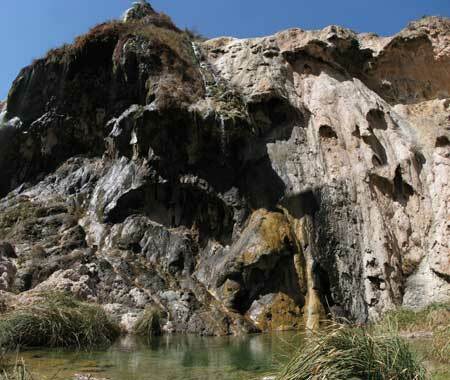 The water falls 150 feet to a blue-green pool. Morgan enjoyed a swim in this pool. We enjoyed a picnic lunch at the Sitting Bull Recreation Area. Click the photo to see a larger view. After finding Sitting Bull Falls we drove around the mountain and to it's highest point to find Five Points Vista. From this point we are able to view the valley below. On the way we came across a small community, Queen, with one store/cafe/RV park all in one building. Click the panorama below to enlarge. want a quick entrance. 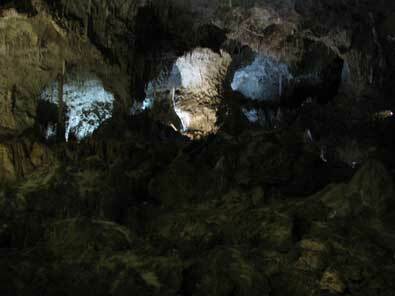 There is a snack bar, gift shop and rest rooms at the bottom of the cave entrance. 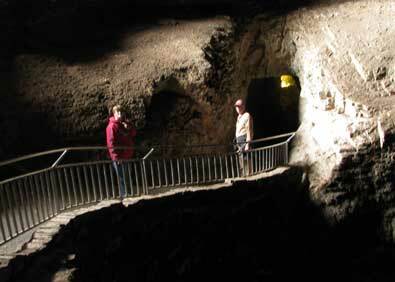 Once you are 750 feet underground, you have several path choices. 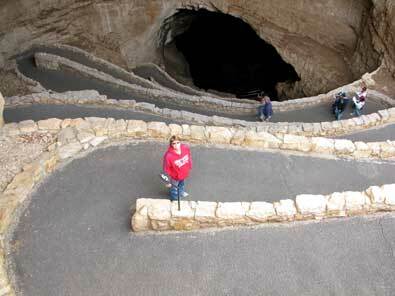 The path we chose took us another 1.3 miles in a tour through the Big Room of the cavern. There are guided tours available but you must reserve your space weeks in advance. We rented an "audio tour" for $3 which explained everything as we toured the big room. Of course, before leaving, we had to visit the gift shop for T-shirts and souvenirs. 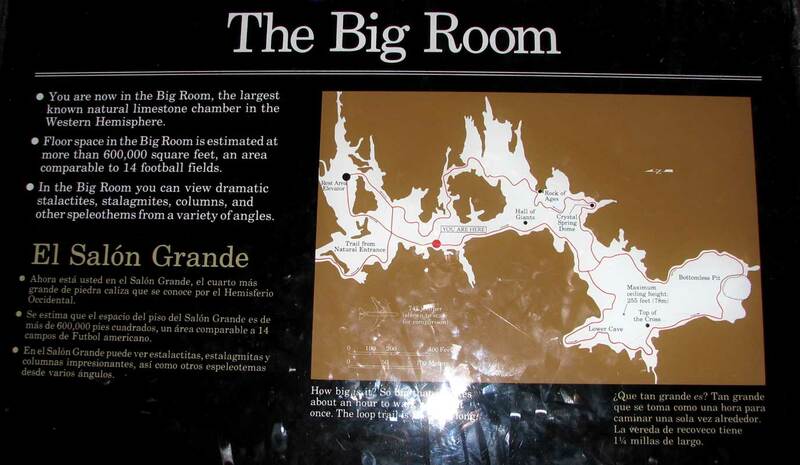 Click The Big Room map to see a readable view. Wednesday, March 24, 2010: We've moved today, only a few miles to Brantley Lake State Park. It's probably ten driving miles but only 3 air miles from The Ranch. We've moved because it's essentially free for us to park at a state park while The Ranch is NOT free. The state park actually gives us more privacy and a better view too. We were also struggling trying to keep Annie (our cat) cooped up in the trailer because "all pets are required to be on a leash". We were told of this by a neighbor parked two trailers away who happens to have several outdoor bird feeders. I'm sure Annie was stalking some of the feeding birds. He told us of Annie "out the door" twice and we figured the third time, we'd be kicked out of the park, maybe forever. Anyway, we arrived at the state park about 10:30 am. With the great view comes "face to face" exposure to the elements too. We experienced 30+ mph winds coming straight off the lake most of the day. But, tonight, the wind has stopped and the weather man promises little wind and ten degrees warmer tomorrow. I'm working the rest of this week on the college course I'm teaching in the spring quarter. We will also finish our 2009 income taxes. So being parked in a remote state park is a good thing. Click the photo below to enlarge. Thursday, March 25, 2010: We hiked to the "primative" camping area where Morgan could swim. The water is clear but doesn't look clear due to the color of the sand. This is a huge gravel dam apparently used as flood control. 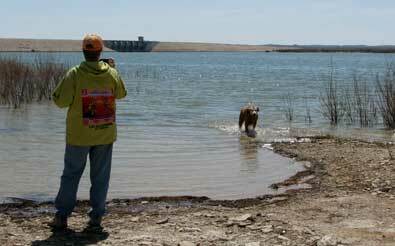 It's nearly April and very little water seems to be flowing into the lake from the Pecos River. If the area were to fill with water, the place where we are standing, including all of the primative camping areas, would be 30 feet under water. steady winds in the 40s. Morgan and I still enjoyed the hike but the trailer was getting tossed around pretty well. It feels like we are in a boat on a rough sea tonight. Check the details here. Click either photo to enlarge. Saturday, March 27, 2010: After a slow start, we took off (almost literally since the wind has not decreased much) to Carlsbad to do a little shopping. Gwen had also made a dinner date with some friends she met in her Internet craft group. We took Morgan for a walk and swim in the Pecos River as seen in downtown Carlsbad. We've seen the river as it flows south toward Carlsbad and there isn't enough water in the Pecos to provide all this water so I don't know where all the water is coming from. You can rent a canoe or paddle boat and take a "river cruise". After the hike and swim, we used my new Elks Club membership to have dinner at the Carlsbad Elks club, my first use of the membership. We enjoyed the company of Pat and Ron from Texas although they are like us, they sold all their property so not really "from" anywhere but where they are currently parked. You can click the photo above to enlarge. Monday, March 29, 2010: After getting the twenty-two students in my college class started on their course work, Gwen, Morgan and I take a final hike to Brantley Lake on the Lake Loop Trail. When Morgan spotted the water she ran for a swim. 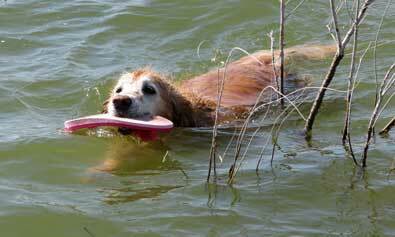 I found an abandoned thong which Morgan loved to retrieve from as far as I could throw it into the lake. You can click the photo below to see an enlarged view of Brantley Lake State Park from the north. Our fifth wheel is on the right side of the photo. from the pass at 8,900 feet. It was easy for Ralph and Janet with their exhaust brake but I had to stop twice to let my brakes cool and I kept the engine in first gear most of the decent. The photo above shows the decent to Alamogordo with the White Sands desert in the distance. You can click to enlarge the photo. Oliver Lee is in south central New Mexico, 12 miles south of Alamogordo. We are actually back tracking a bit because we want to reach Silver City before April 17 when there is a city-wide craft show. Silver City is north of Deming where we stayed for a week but we didn't visit earlier because it is at a higher/colder altitude. There is also much to see and do in this area so we'll spend some time relaxing and visiting in this area before leaving. We have a wonderful site on the outer loop giving us great views of the Sacramento Mountains plus the desert below. Many of the Yucca plants are in bloom so we will investigate and photograph them tomorrow. Click any of these photos to get a different view. 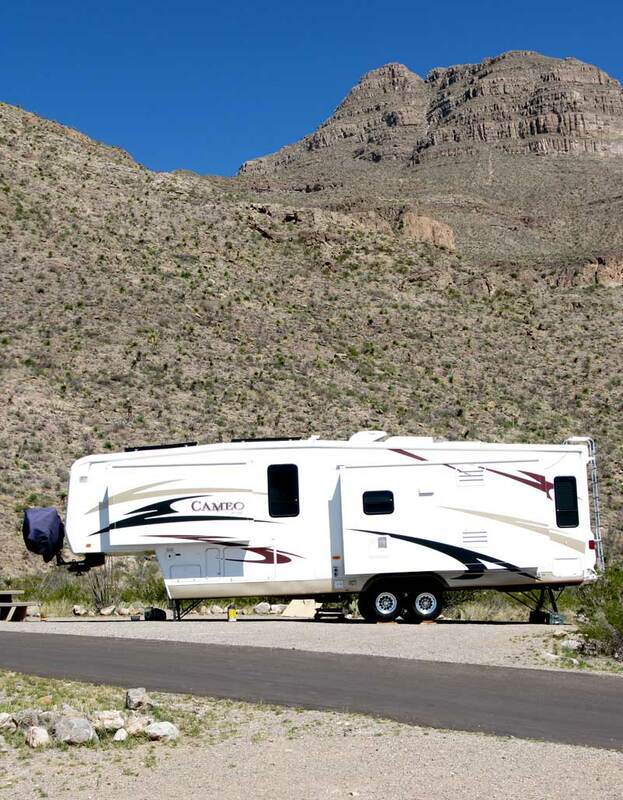 You can see the white specks of the RVs up against the Sacramento Mountains in Oliver Lee below. This new location is a "developed site" but has no power or water connections as we had at Brantley Lake so we are back to using solar power exclusively. We must pay $4 extra per night when we have a power connection so this also means the site is totally free for us since we have our annual pass. Gwen wrote a great story about our trip from Brantley Lake State Park to Oliver Lee Memorial State Park including a photo of the warning sign seen several times on the way to Cloudcroft. 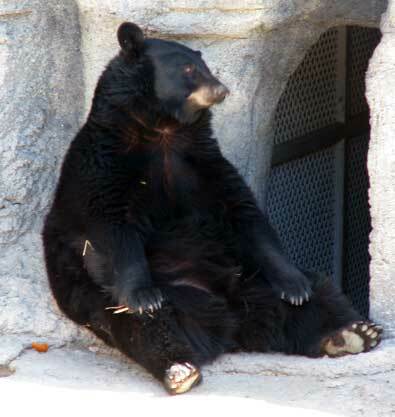 Wednesday, March 31, 2010: What a great relaxing day. The temperature was warm, light winds, a perfect day to work on notes for a college class. We also spent more than an hour at the Oliver Lee Memorial Visitor Center learning about the area before and after white settlers arrived. 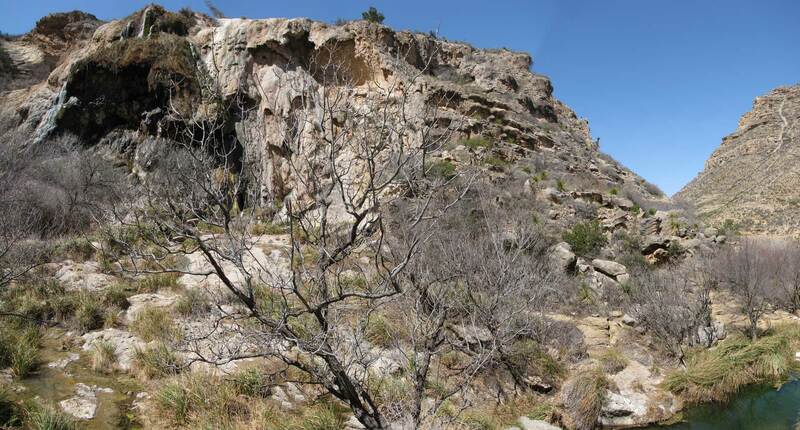 The Mescalero Apaches occupied and ruled this area until the US Calvary arrived in 1850. From 1850 - 1881, the Apaches and Calvary had "skirmishes". 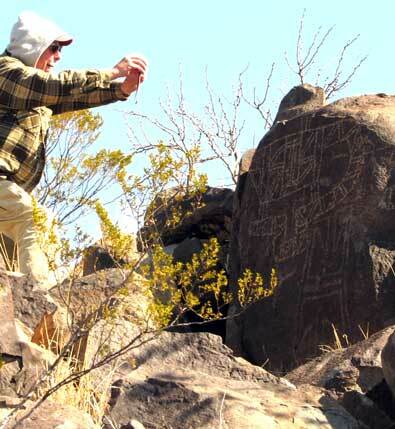 By 1881 the Apaches were moved to a reservation and Oliver Lee developed a ranch in the area. He eventually became a state representative then state senator. He died at the age of 76 in 1941. It was interesting to learn that he was charged with murder in 1896 of an army officer and his son. He had a run-in with Pat Garrett, sheriff where Garrett deputy was killed. Lee was not charged with that killing and was acquitted in 1899 of the murder of the army officer. Personally, I think this should be the Mescalero Apache Memorial Park. They were here for 600 years before Lee arrived. The Yucca plants are in bloom around the park. 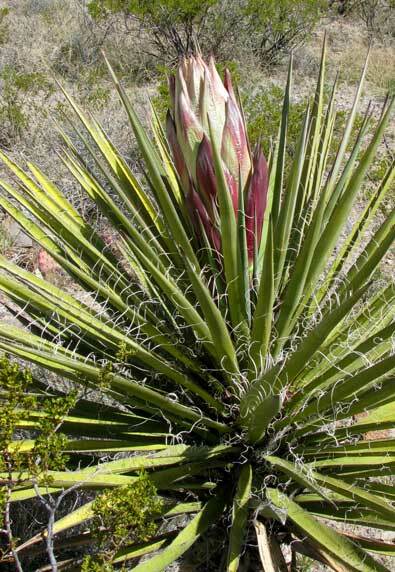 Swing your pointer through the photo to see this Yucca bloom. Friday, April 2, 2010: We drove back to Cloudcroft at 8,600 feet today to take a better look. It reminded me of the city of Truckee, California. 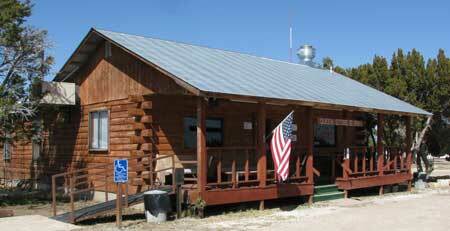 There are many small shops but many motels and rental cabins. Apparently the area is more active during the summer and during the ski season (just like Truckee). Pass your pointer through the photo above to see both ends of the street. 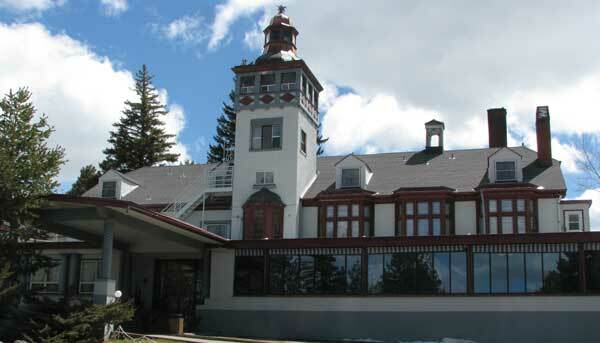 The Lodge below was built in 1898 and is a popular spot for tourists. Pass your pointer through the photo below to see the Tularosa Valley view The Lodge guest will see. Note the White Sands desert in the distance. The best building in the town is the high school found only about 1/4 mile from the center of town. We are still camped at Oliver Lee Memorial State Park. 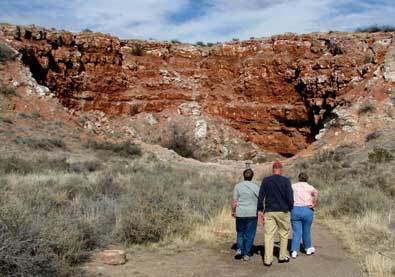 Today marks the 23rd day of camping at New Mexico State Parks so today is the "break-even point". 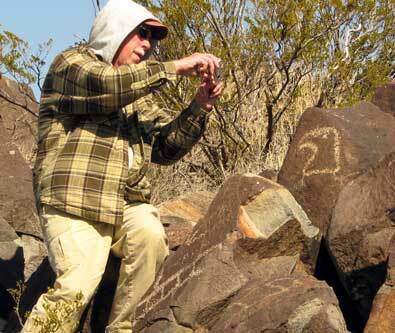 You see, New Mexico charges $10 per night for their developed campsites so 23 nights would cost $230. 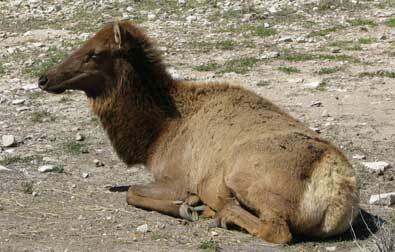 Our state park pass cost $225 so from now on our New Mexico camping is free. 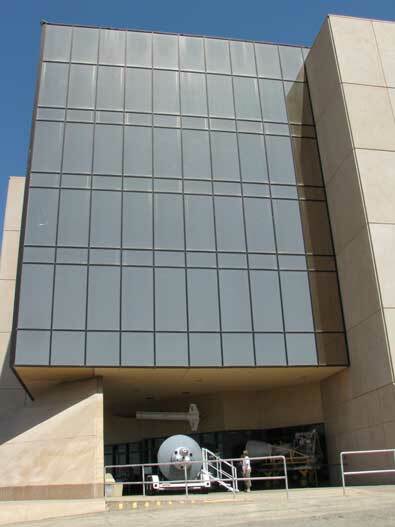 Sunday, April 4, 2010: Yesterday we visited the New Mexico Museum of Space History. 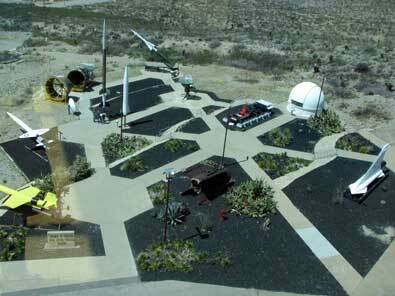 The is a very impressive complex located on the foothills of the Sacramento Mountains overlooking Alamogordo. The museum is what it says. You begin at the beginning of space exploration and development of rocket science in the 1940's by taking the elevator to the top of the museum, then working your way down the ramps to the bottom floor. As you descend, you get closer to present day time. Fortunately, the exhibits end on the second floor so there is enough room to expand for another few years of space history. The indoor exhibits includes the first "Sputnik" satellite working through the Apollo missions, Shuttle missions and into the current International Space Station. You can also practice simulated shuttle landings. I was able to land my shuttle while everyone before and after me (at least while I stood and watched) crashed theirs. The outdoor exhibits include several military rockets, rocket sleds, rocket planes, guidance systems, tracking systems, a life size model of the Mercury capsule that you can sit in, and the largest rocket is the rocket to test the escape system for the Apollo capsule. Pass your pointer through these photos for another view.